How can I get to Thassos from Kavala airport? Is there transport from the airport to Keramoti? From there with the ferry I guess I saw some post with timetables, and which beach do you recommend to visit in Thassos? I only have a few days. thanks! Most people not using a package holiday get a Taxi said be to around 20€s last time I heard. Thassos Town where the ferry arrives has beaches but not very big ones. We prefer Golden Beach where this site has a webcam overlooking it. Again another cab is around the 20€ mark but you can catch a bus there as bus depot is opposite the ferry terminal There are quieter places but it depends on what you want from you break. Where delboy loves the bigger, livelier golden beach, I prefer the quieter skala rachoni ... €18 euros in a taxi from Thassos but as del mentioned the bus station is right across the road and they are very helpful, the driver will tell you where he’s stopping so you don’t miss your stop, the bus is €1.80 one way. Thanks for your answers! so there is public transport in the island to Skala rachoni, also to Golden beach? I will have a look at skala rachoni...have seen so many beaches already...I am confused The beach in Thassos does not look very nice in the photos, best is to go somewhere else right? Any recommendation on a car rental company in Thassos? I might consider the option, to see many places as possible if it´s not super expensive. Yes there is a bus to Golden Beach from Thassos Town. You can consider Thassos Town as having the hub for buses going all places. Many people like Thassos Town but just does not do it for us but everyone is different so could not say if it is for you or for any place for that matter. For the time of the year June / early July we found Golden Beach Skala Panagia end just right for us. It had enough restaurants to keep us going for two weeks and we could pop into Skala Potamia which has about another 50 taverna's in it. Late July / August it will be packed. No public transport from the airport to Keramoti as far as I am aware, people use taxi's. Leanne will help you with Skala Rachoni as not visited it as reading up on it initially there did not seem to be many taverna's there for our holiday but may be wrong. I don't drive abroad so can't give you any recommendations. The asphalt roads on Thassos have always been open and were never closed this summer. Only a few of the dirt roads that go through forestland have been closed on certain days as a precaution to prevent a fire, specifically on days when we had very high winds. On Friday I went to Vathi Beach and the dirt roads were open all day (I went and left without a hitch). So it's not a continuous road closure... in fact, it mainly depends on weather conditions and the fire risk assessments by the Thassos Fire Department. I discovered this year there are a lot more tavernas up and down Skala rachoni than I reaslised last year, and will be going to some of the hidden ones when We go back (13 sleeps) ... we do have a favourite though called Gekas. We did hire a car but though the hotel so can’t really give too much advice on best places to use although I think Augie had a suggestion a while back. I did notice a few signs saying rooms to rent but I remember last year when we went end of July the rep mentioned ther were no rooms on the island so I’m guessing silly season you would need to book and not just arrive. We went thought Thomas Cook (we can only book the hotel we love though them) but I’ve also looked though this site and there are some lovely places. The bus timetables changes during some months I don't think you will find them on line as they print them off and supermarkets put them in their windows obviously the bus station will have them. I have them photographed on my computer in June 2015 but not much help. Where are you intending going ? 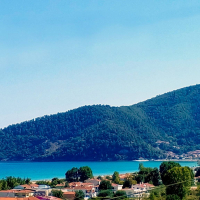 I can't comment on the best ferry route to take as we've always gone Keramoti to Thassos, what I will say is that getting the ferry into Thassos Town will give you better transport options to wherever you're staying. The weather in the middle of September is usually very pleasant with temperatures ranging between 25-30 degrees celsius (on average). Augie what would we do without you!